How much is Nghtmre Worth? Nghtmre net worth: Nghtmre is an American DJ and music producer who has a net worth of $6 million. 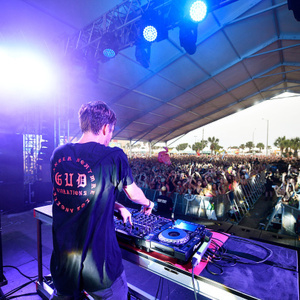 Nghtmre was born in Stamford, Connecticut. His musical styles include trap, house, and future bass. Nghtmre released his debut EP Nuclear Bonds (with SLANDER) in 2015. He released the extended play NGHTMRE in 2016 which reached #17 on the US Dance chart. Nghtmre released the EP Magic Hour (with Pell) in 2018. His single "Need You" (with Dillon Francis) reached #21 on the US Dance chart. He has remixed songs by several artists including Skrillex, Tiesto, and Rae Sremmurd. Nghtmre has collaborated with artists including Richard Vission, Pegboard Nerds, Krewella, Flux Pavilion, Zeds Dead, LOUDPVCK, Ghastly, and more. He has been associated with the record labels Mad Decent, Monstercat, and OWSLA. Nghtmre's career picked up steam when Skrillex played one of his songs at the Ultra Music Festival. He later went on to play at the Coachella Valley Music and Arts Festival.